There are more than 1,570 suites in M City’s 62-storey M1 and M2 twin towers, and they’re more than 95 per cent sold. Construction on both buildings began in early July in anticipation of autumn 2021 occupancy, so Reeve said the time was right to launch M3. Five of Canada’s top architectural firms were given a stipend and invited to enter a design competition for M3. 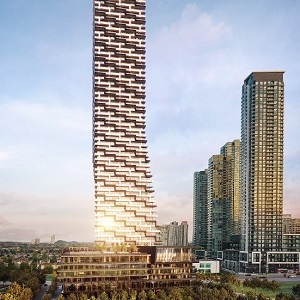 Toronto-based IBI Group was chosen as the winner for its slender tower which features subtle twists at the lower and upper sections, saw-tooth balconies which create a black-and-white diagonal pattern up the building, and a dramatic sloped crown at the top. The building will also include a podium, which is still being designed. Reeve said three criteria were used to decide the winning M3 design: it had to be a beautiful and iconic skyline building; it had to have a floorplate which accommodated a great set of floor plans; and the developers needed to be able to build and bring it to market at a price which potential buyers could afford. Market research showed M3’s condominium suites should be slightly larger than in M1 and M2, so the almost 900 units will range from one to three bedrooms, and from 480 to more than 1,000 square feet. M3 will also include approximately 15 two-storey townhouses. Prices will start in the mid-$300,000 range, with condo fees around 50 cents per square foot. A broker preview event will be held on Oct. 18. Sales should begin about a week later. “If everything goes according to plan, the way that M1 and M2 did, we got under construction a little more than a year after we got sales going,” said Reeve. “We’ve got a two-storey amenity pavilion on top of the podium that has an indoor pool, an amazing fitness centre, a big terrace next to the pool, barbecue areas, party rooms, a lot of kid-friendly facilities, an indoor playroom, an outdoor playground and a splash pad,” said Reeve. Reeve said energy-efficiency is an important part of M3’s design. While there will be full metering of energy and utility consumption within the units, they aren’t targeting a LEED certification. Instead, Reeve said the focus is to keep operating costs down. Looking ahead, Reeve expects the M4 condos to launch in the spring, using a different design from the first three M City buildings. That design was submitted by one of the other entrants in the M3 competition and the developers “loved” it. The 15-acre, 4.3-million-square-foot, master-planned M City community was designed by Cooper Robertson of New York City to reflect Mississauga’s vision for a new downtown. It will also introduce two acres of public parkland to the site. Ted Rogers, the late Canadian communications tycoon, purchased the 43 hectares of farmland in Mississauga in the 1960s as a location for transmitters for Toronto radio station CHFI. Rogers developed some of the property, and sold land to other builders for new homes when the transmitters were relocated in the early 1990s. The current M City site was rezoned in 2002 to allow for a wider possibility of land uses, including increased residential development. “With the Rogers family backing this project, it brings an immense amount of credibility and certainty to the process,” said Reeve. “They love what we’re doing and have embraced the concept of making this a real legacy project. Rogers Real Estate Development Ltd. is part of an affiliated group of companies, which together represent the Rogers family’s private holding companies. It engaged Urban Capital to manage the development of M City. Urban Capital has more than 5,500 condo units developed or under development in the Greater Toronto Area, Halifax, Ottawa, Montreal, Winnipeg and Saskatoon. While M City’s original plans called for 10 residential buildings, Reeve said it’s more likely it will include eight or nine.